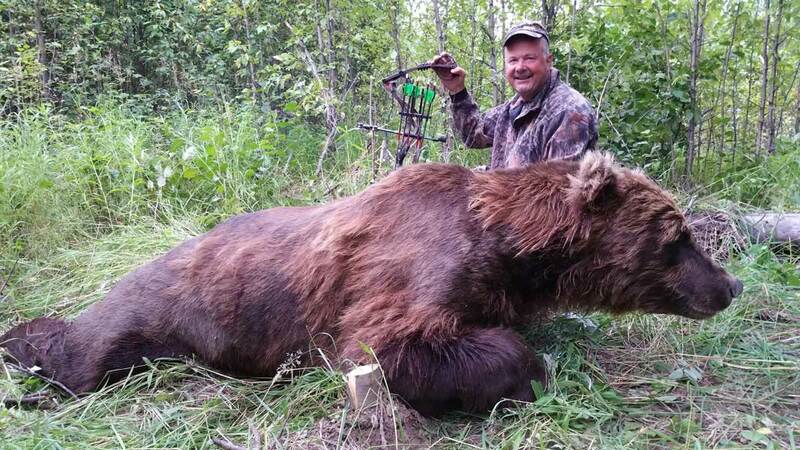 Alaska Brown Bear Hunting with Alaska Elite Outfitters in Bristol Bay Alaska you will be provided a top quality Brown bear hunt. We use many different hunting methods to harvest Brown Bears. For Example, Brown Bears love scavenging on winter kill moose and caribou and as a result an excellent opportunity for hunting them. At the same time, this results in many harvested Brown Bears. In addition to our May Brown Bear hunting packages coincide with the Alaska Moose calving season. Brown Bears can be found out looking for there next meal any time of the day. In addition to we utilize several calling methods to bring brown bears in close. In the Springtime Bears are hunger because of this it is hard for them to resist the sound of a dying animal. Hunting by jet boat, we travel up and down the river corridors and as a result of this cover a vast area. By doing this, we increase our chances of running across bears. Alaska Brown Bear hunts are conducted in Southwest Alaska in the Game Management Unit 17 near Bristol Bay. The southern part of this area starts at the Bristol Bay shoreline and runs north to the Kill buck Mountains. The eastern border of this area is the famous Mulchatna River Watershed. Then runs west taking in the Nushagak River drainage’s, and Nushagak Hills. This area is about 170 miles long by 90 miles wide, roughly 15,000 square miles. The areas we hunt feature lake and river systems in which 4-5 million salmon spawn annually, which is one of the largest concentration of wild salmon spawning anywhere in the world! As hunters know, when you have concentrated levels of salmon, you’ll have concentrations of Brown Bears. Grizzly Bears are not the same as Coastal Brown Bears. Grizzly Bears are smaller due to being located more in the interior of the state where they feed primarily on rodents and berries instead of Salmon. Interior Grizzly Bears also hibernate for more extended periods as opposed to the coastal counterparts. Because there is such a difference in diet big Grizzly Bear males rarely reach 600 lbs whereas Coastal browns can reach 1200+lbs. Coastal Brown Bears and Kodiak Brown Bears are also larger and feed extensively on Salmon and males can reach weights that exceed 1200 lbs. The difference between the Kodiak Brown Bear in contrast with Coastal Brown Bear is the Kodiak Brown Bear lives on Kodiak Island and is technically a subspecies of the brown bear. We have a substantial population of Coastal Brown Bears with the most liberal hunting season and bag limit anywhere in Alaska. Our bear hunting season is open for over nine months per year. As a result of this, it offers us four months (April, May, Aug & Sept.) of prime bear hunting opportunity. We hunt brown bears in the spring and fall every year with a limit of 2 bears per year. These bears range from 8 to 10 feet square, with skulls that vary from 22″ – 29″+ and are at their heaviest during the fall season. Rubbed bear hides are something you don’t have to worry about in Southwest Alaska is very special because in the last 18 years we have never had a rubbed bear hide. Spring or Fall the bear coats in our area are magnificent with no signs of bear hide damage in addition to this our region has all four color phases of Brown Bears (dark brown), (blonde), (chocolate) & (blonde w/choc legs). Our historical success is 75%-80%, depending on the year and weather. We take a limited number of hunters and are committed to providing each client with excellent service. And above all a high success rate on large Alaskan Brown Bears.